Over 160 unique designs including 12 projects. With this Collection you can make pot holders, towel toppers, magnets, mason jar covers, and so much more! You won’t find yourself in a pickle when making these designs, because they come with step-by-step color tutorials and ingredient lists to ensure that making these designs is as easy as pie. These fun designs are sure to add a sprinkle of homemade love to your kitchen. 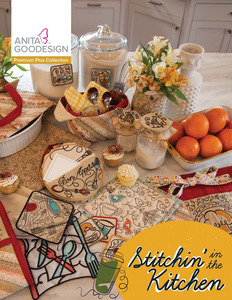 We know you’re itchin’ to get stitchin’! Eat, drink, sew, and be merry!